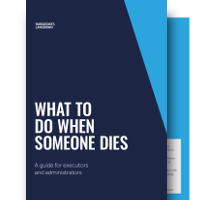 Dealing with the financial and legal aspects when someone dies can be daunting, so we've written this guide to help you. It isn't advice. We hope this guide will give you useful information to help you get things in order, but it shouldn't be taken as personal advice. Remember rules can change and you should seek advice if you're unsure of what to do. Dealing with the death of a loved one can be an extremely difficult time, and having to deal with the financial side of things can seem overwhelming.